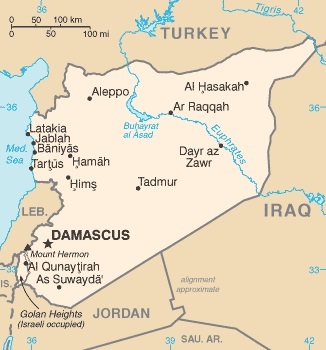 The Syrian Arab Republic is a a country in the Middle East, located on the eastern shore of the Mediterranean Sea. It is bordered by Iraq, Israel, Jordan, Lebanon, and Turkey. As of 2009, the population of Syria was estimated as being 21,906,000. The country's capital and largest city is Damascus, which, as of 2007, had a population of about 1,669,000, with a total of about 2.7 million people living in the combined city and surrounding metropolitan area.